My food court review is in this week’s prairie dog magazine, the product of an increasingly greasy odyssey through mall cuisine, undertaken entirely on one quiet Sunday. I order the biggest special on the menu: three perogies, one cabbage roll and one bratwurst, which comes to $6.20. A bowl of borscht is another $2.45. The young woman behind the counter tells me it will be a few minutes while she makes more perogies. No problem, I say. It gives me the opportunity to discover that the Victoria Square Shopping Centre has two leather clothing boutiques. When I get back, having wondered about the possible circumstances that could result in two leather stores in one small shopping centre, the woman has arranged everything on the tray with such precision that I must be in the presence of an artist or an OCD sufferer. Not only does everything line up at right angles, it’s all shades of brown. From the oil drops on the surface of the borscht to the deep chocolate of the tray itself. Against all that brown, the dollop of sour cream and white plastic cutlery leap out at the eyes. The photo above is not from a food court meal. 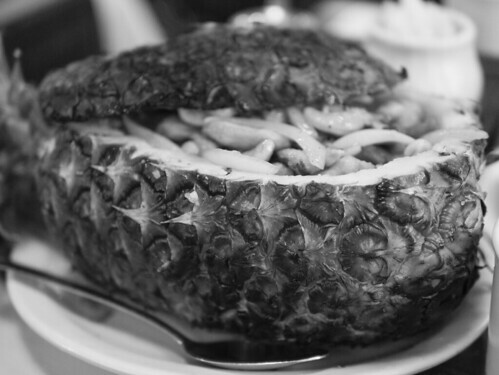 But it’s a hollowed-out pineapple stuffed with rice and chicken and Chinese sausage and cashews. And that needs no justification.